Just as the end of summer approaches and we are gearing up for the upcoming Intensive Wean Clinic, our time has not been dull. River had two appointments last week: her GI check-up and then the visit with her Neurologist. Her GI visit was rather run-of-the-mill. Her growth looks good. She’s up to 24lbs 8oz. All her growth numbers indicate she’s still trending well, even though she has never made it back to the percentiles previous to her winter weaning. She’s about a 10% on her BMI, so healthy, but a little on the skinny side. We are going to cross our fingers that she doesn’t dip too low during the next wean. The neurology appointment was a little more eventful. We saw the same pediatric neurologist, Dr. Makari, she saw exactly 2 years ago regarding her ptosis, which was dx as Horner’s Syndrome. Back then the doctor was more optimistic that it was partial and would improve. Well it hasn’t, and now that he sees her now, can say it’s complete and will most likely not improve on it’s own. He agreed with me that her ptosis (the drooping eye lid) was a little worse. My concerns have been that with certain factors (brightness, swelling, crying, sleepiness) her eye is nearly closed. He ran her through a few neuro tests, and we discussed all of her motor skills, in particular how her walking is. Her movements are still quite jerky and wide-stanced, like you would see in a very new walker, also the occasional dizziness or off-balance nature. While there could be other issues going on that we are unaware of, it came down to that we need to fix the most obvious issue and see if it’s that. That being her ptosis obstructing her vision. It may be throwing her off enough to affect her balance, if her left eye is occasionally obstructed. I’m sure you can well imagine! So the next move is to return to her opthamologist and have a consult for surgery. Her appointment for that is in 2 weeks. More Surgery?!?!? I know right. Although this could really increase her quality of life! And it’s a small procedure, out patient. And hopefully it’ll be another check mark of triumph in River’s books. More updates about that after her eye appointment. Now on to the news of today: VIRAL(or bacterial) RASH. Yay! OMG is all I have to say. I’ve been lucky to have dodged any childhood contagious rashes or mystery rashes up to this point. 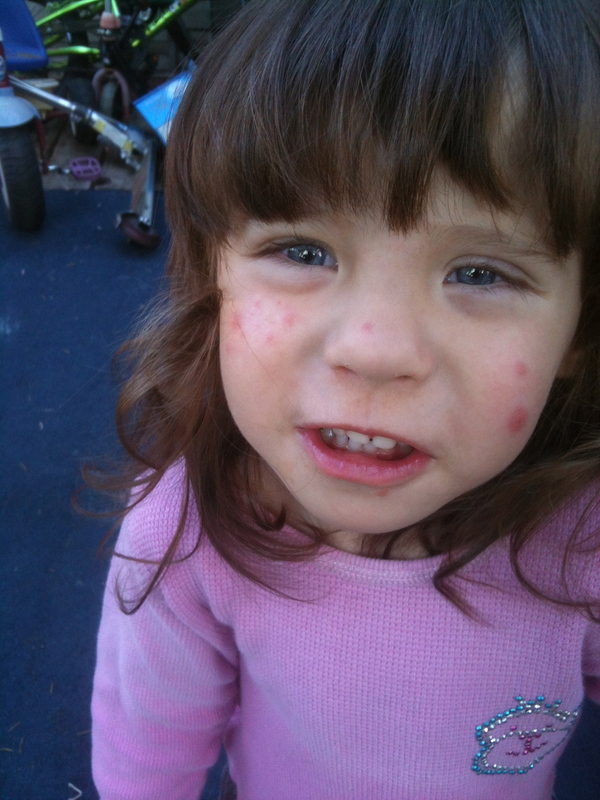 My poor little baby girl is covered in horrible red spots and plaques. It’s one of the most disturbing things I have experienced as a mother, and that says a lot. Rashes totally freak me out. This looks very similar to chicken pox. And one doctor even thought it was! Last Friday we noticed what looked like a bug bite on her leg, a really bad bug bite. No biggie though, didn’t seem to bother her too much. Saturday: morning she woke with little red bumps covering her knees, cheeks, and a few on the arms. I thought bug again, living in her sheets! I tore apart their room. No bug. Sunday: more spots!!! Her condition was worsening, she even seems grumpier. I took her to urgent care. First doctor claimed chicken pox, even though she’s been vacinnated. Second doc seemed to feel it was more Impetigo-like, like I thought(from google research). Which is a contagious bacterial rash. They prescribed an antibiotic and sent us home with a re-check in a few days. I gave her the medicine immediately. Monday: MORE SPOTS!! We are now quarantined at home this week. So far no spots on the rest of us, and no friends reporting similar rashes. Where this came from (my guess the children’s hospital) who knows. She’s even going a little hoarse from it, not sure why it’s affecting her voice. Tuesday: Spots may be, possibly, hard to say, getting lighter? I hope so! We just had a re-check with her regular pediatrician, Dr. Oltman, who feels it might be more viral in nature. But we are already doing everything possible. So only thing now is to continue the meds and wait it out. OMG I HATE RASHES. Poor Little River looks like she’s had a pox cursed upon her!! So this Friday we were supposed to go up to Seattle Children’s for her swallowing study that the NP wants for the feeding clinic. I just rescheduled that to the following Monday, hoping that gives us enough time for this to go into remission. I can’t wait until my psychosomatic itching goes away, because I’M GOING NUTS. River seems more comfortable than I!! !